Quick update: getting IVIG infusion Thursday but like I said in a previous post I may owe thousands of dollars due to an error. I’m supposed to be on them for life or ongoing but I can’t afford that. I will start LDI injections (different from LDA) this week. You inject and take prednisone for 3 days with it. I hate prednisone for how it makes your face/body swell. I’m not progressing and feeling worse. In 6 years of treatment I may have progressed 5-10% but I think I took a step back. The only symptom that is better are my tremors which were like Parkinson’s but now doing better. Also I’m able to walk pretty good so I hope my spine doesn’t go out again and put me back in the wheelchair. Also football season and fall are coming and it’s my favorite time of the year with new tv shows. After taking pretty much every brand and antibiotics on the market I had a few that were much tougher to take than others. I see people who take them for only 10 days and say “how can anyone do ten whole days of these”. If those people only knew what lymies have to go through. I have been taking antibiotics everyday for the last 5 years or so. I don’t remember a day not on them except when I had severe candida and c-diff I had to stop for a month. Anyways after all those antibiotics my Lyme has responded to only a few and there are a couple that were tough. Doxycycline was the first antibiotic I ever tried and my Lyme didn’t know what hit them so I had a nice die-off rash on my body which was dime to quarter-sized marks on my body. They look almost like birthmarks but they go away after about 2-4 months. The second time I took Doxy and third, fourth I didn’t have any response to the med. I think it was just that first antibiotic in my body that killed off the non-cyst/biofilm Lyme in my body. The other antibiotic I have a response to is Minocycline for the Lyme in my brain. One of the antibiotics I don’t like is flagyl. Now the one I don’t like is the sulfur smelling Amoxicillin. 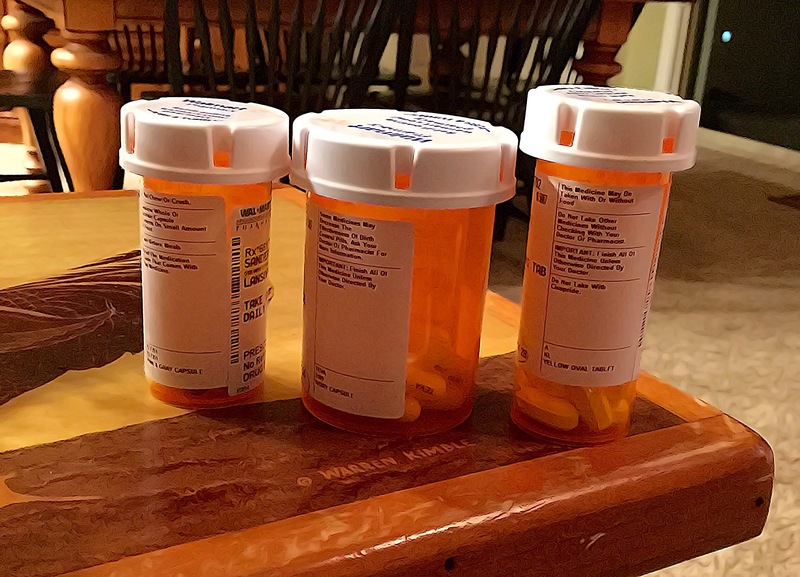 I’ve been on it before but right now I’m taking 4 pills 500mg each (2000mg per day) for the H. Pylori with Clarithromycin 500mg 2 times a day (1000mg per day). They gave me Lansoprazole 60mg per day to keep the antibiotics down. But all I taste in my mouth is the Amoxicillin all day/night long. Even if you drink water, eat a lemon, garlic…etc you still taste Amoxicillin. Even mouthwash doesn’t help and while you sleep it will come up your throat into your mouth. It’s not very pleasant and your sweat and other stuff smell just like it. Amoxicillin is also giving my severe restless leg syndrome (RLS) or something similar where I will wake out of a deep Chronic Fatigue sleep and I toss and turn every second for hours until it drives me insane and I need to get out of bed and walk to the living room where I lay in my chair the rest of the day/night (24/7/365 is in bed or the chair, except doctor appoimemts or rarely going to eat for an hour with my godson & friend). While in the fair I have to keep moving my legs until I can get some nor I in me then it seems to relax some. I tried my usual muscle relaxer, magnesium, morphine before bed etc and nothing seems to help it. It only started while taking the H. Pylori meds. I had a few other antibiotics that either left a metallic taste in the mouth or did damage to the muscles but I can’t remember the names right now. Once this H. Pylori treatment is over I will go back on Minocycline daily and Tinidazole. I just didn’t want to mix so many antibiotics each day like I used to do when first treating. Dr. H had me on aggressive treatment and it did damage on my gut and body yet he never seemed concerned. For those with H. Pylori you may be on the same meds I am taking. If you want to know what can help get rid of H. Pylori I will list the meds below. Mine has caused severe D. But I’ve had IBS-D for a good 15-20 years ever since going to Mexico. Already treated for parasites and other stuff but recently found out I was positive for H. Pylori too. I swear every test I say “I don’t have that this will be negative” and it comes back positive or high or low so don’t ever think it can’t happen to you or you don’t have something. What I mean is with all my hundreds of symto a I don’t even notice when something is giving me a symptom. Like some people say “that gave me stomach cramps and bone pain” I wouldn’t notice became I always have stomach cramps and home pain..etc. Spoonies: start each day with a positive thought and positive word about yourself and find something in each day that makes you smile. Even if it’s just a summer breeze blowing through your window and it brings back memories, let that make you smile. We will all get to those better days. I’m starting LDI Injections this week or next. I have my IVIG Wednesday and my home nurse said he would do them for me but they forgot to prescribe the prednisone with the syringes. The doses in the picture are 12c/12.5c/13c. I am also going to ask about the sublingual LDI. 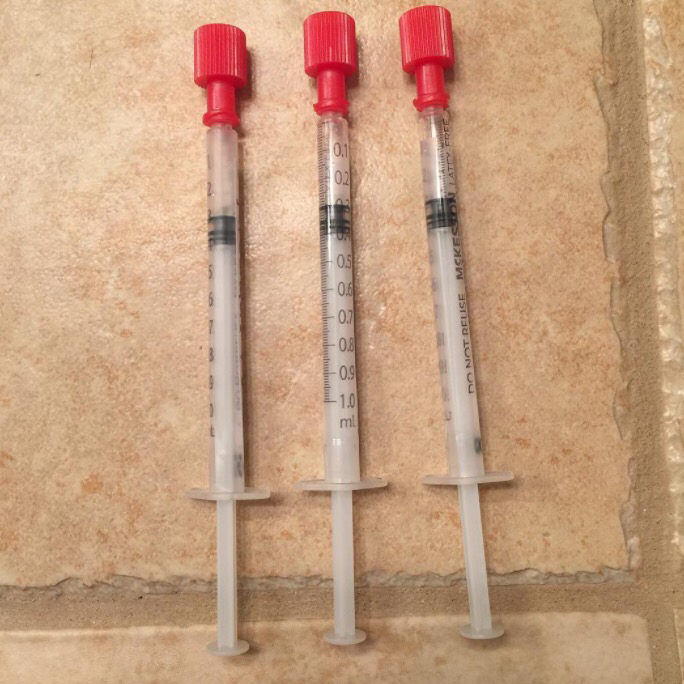 For those unfamiliar with LDI or LDA just google “LDI injections for Lyme disease” and it will explain more than I can or have the energy for. Hopefully these will make me feel even 5% better since I feel like I’m declining. My CFS is worse and may pain is severe so the morphine is no longer doing much. I’ve had every pain option there is so I’m running out of options. Still waiting on Ketamine infusions. Basically I’m home bound but I can walk now but once I sit in my chair I don’t get up. I just watch tv all day/night in pain. That’s pretty much my life right now but it is better than when I was bedridden and in a wheelchair. I found out my IVIG study program may not be 100% convered like they told me it was. I received a $6,000 bill. I think the IVIG is costing me $700 per infusion but they were $550 before the study program and that included the nurse. We are still trying to figure it out but I can’t afford that. Keep hope alive and never give up! Fight! Okay before you get offended or think this is mean hear me out. I’m writing this as I’ve been struggling all day with my health and crying in pain. I’ve been struggling with my health since I was a baby. In all of those years I have only met a few doctors who actually cared or showed compassion. Doctors take an oath to help all their patients who need help yet I find that instead of helping, most of the time they make things worse. I’m laying here sicker than usual and it crossed my mind about a doctor visit a year or so ago. It was an immune doctor at UC Davis who not only belittled me but he was a jerk during the visit and when I went for the follow up he canceled last minute while I was in the waiting room knowing I’m home bound and it took a lot for me to make it to that appointment. When I asked why he canceled 10 minutes before my follow up his personal nurse said “please come with me down the hallway (knowing what she was about to say would piss me off). The nurse said “Dr. N (N stands for neglectful but it’s also his real initial because I don’t care who knows) told me that he does not believe you have any of the illnesses you claim or in your records and that over the past 30+ years all of your doctors diagnoses were wrong”. I said “wait so you are telling me my 40 or so doctors over the years from Sutter, Kaiser, Northbay..etc are all wrong and my positive tests, MRIs, x-rays eye are all false?!!”. She said “that is correct he looked at your immunization test and he thinks all you need is a shrink, he said you don’t have lupus, CFS, Lyme, FMS, POTS…etc but rather it’s all in your head”. So by one immune test (that wasn’t normal it showed my immunizations never worked because I have no/weak immune system) he can tell all that? “Wow he must be some kind of God”!! I said sacastically, followed by a “tell that doctor to retire and to go F himself” as I walked out. I’ve learned over the years that doctors only care for those patients with physical wounds they can treat and a nurse even confirmed that one night in the E.R.. I’ve had doctors tell me straight up “I do not want to be your doctor or help you please move on” after meeting them for the first time. Not because I said anything wrong because most of the time I don’t even talk but because he read in my chart “chronic Lyme disease”. 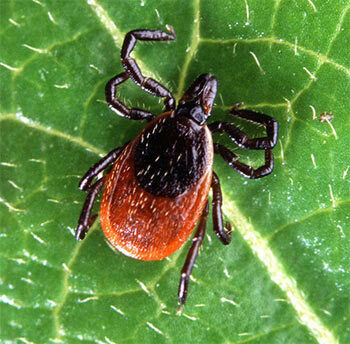 Doctors refuse to believe ticks can get out of the east coast and it baffles me that someone who went through school that long can be that stupid. It’s funny when the patient has more education than the doctor. I love to study and learn and was a computer programmer among many other things and almost a police officer before Lyme took my body away from me so I don’t take crap from any doctor and I know more than they think I know. I just wanted to share this because I know every week somebody is going to an appointment and coming home crying because the doctor made them feel stupid or crazy and didn’t even try to help them. Don’t let any doctor make you feel that way doctors aren’t gods most are just crabby assholes. My mom’s doctor once told her “you’re fat you need to lose weight, I’m not fat because I play tennis”. This was from a very popular doctor. That comment still sticks with her and she’s not even fat! That doctor was a short stalky man with a beer gut so I don’t know why he thought he was cool enough to say that. If I was there I would have punched him or threw him around like a rag doll. Lol So don’t ever feel like you are crazy or take the first doctor’s advice, always see at least three to four doctors and if one believes in you then give them a chance. There are good doctors out there but they are rare. Hope this helped some of you who have went through this already and thought you were the only one. I hear these type of horror stories from my Spoonie friends all the time. 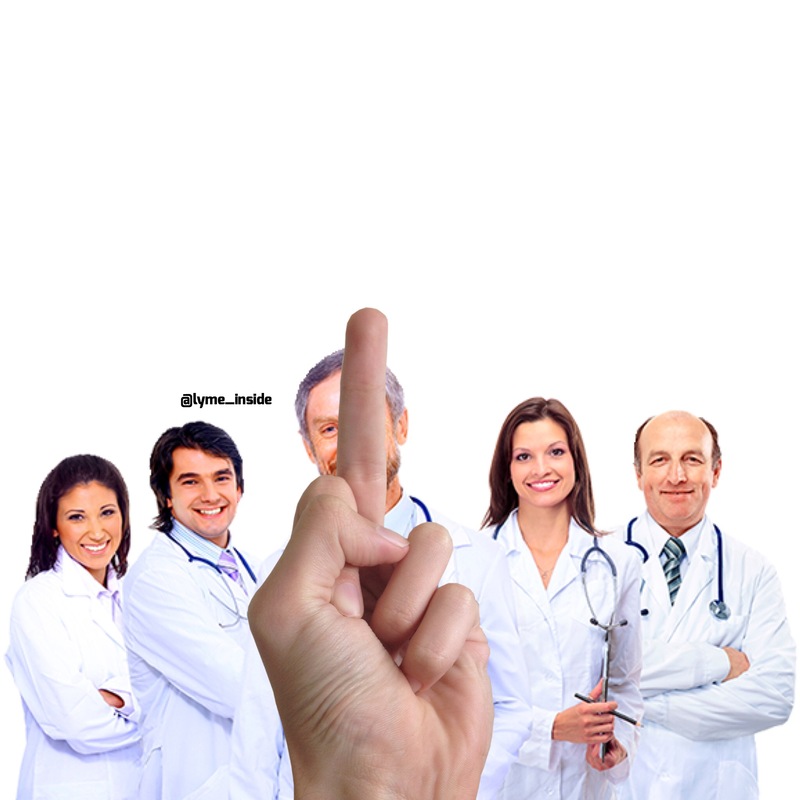 Next time a doctor makes you feel bad or doesn’t believe your positive test, just give the doc the middle finger and walk out of there.